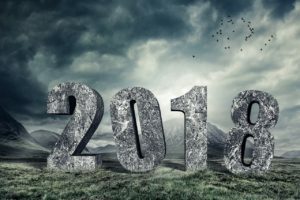 Getting Ready for 2018 – Are YOU Ready? It’s that time of year again… time to get some plans together for the upcoming year and to put together goals and projects. There’s a lot of power in using the calendar to set your goals – whether it comes from the symbolism of the new year and new beginnings, putting goal attainment dates on a specific day, or what have you. And I’ve already started to look at the things I need to work on and what I am going to do to work them regularly in 2018. I tend to be a moth – attracted to bright shiny objects and fluttering to them. I love to read and write about all these topics. My podcast playlist is constantly evolving as I look for the perfect programs to listen to and garner information from. I read a ton of blog posts and try to incorporate them into my routines – usually at the risk of throwing any sort of periodization I might try with my routines into a quagmire of re-starting constantly. Well, no more. One of my exercises I’ve done this year is to come up with a serious routine of workouts that I am going to concentrate on. And as I will go into more detail below, it’s going to be primarily MovNat based again. But even beyond that, I’m going to be seriously working on an overall focus on increasing my personal discipline. Morning routines are going to be a big part of the situation – incorporating my movement, Wim Hof work, personal development study, and PLANNING PLANNING PLANNING. I’m making a particular focus to work within the guidelines of The Sacred Six: The Simple Step-by-Step Process for Focusing Your Attention and Recovering Your Dreams – the book by my mentor JB Glossinger of MorningCoach.com. I’ve listened to his podcasts for years and know that I have the proper thought patterns, but haven’t ever really seriously put this work into play. This is the year I shall do just that – I’ve already started working more closely with his program and getting my values, mission, goals, and projects into alignment with what I want to do. Yep, the number-one Jamie-killer is a focus for me this year. In every race I ran in 2017, grip strength bit me somewhere along the trail. I fell on Kong and Funky Monkey at Tough Mudder. I could barely hold on to the rig at Indian Mud Run. And I slipped on the Gorilla Bars at Mud Ninja. It’s an ongoing challenge for me, but it’s one I’ve decided to take on full-force this year. One of the most beneficial things I got out of last year was, as many of you know, my forays into the world of cold showers and breathing exercises that comprises the Wim Hof Method. I truly overcame a big fear of mine in taking this on – cold water was a big fear of mine, going back to my time as a competitive swimmer. And this change was not just mental – I slept better, I felt happier, and I was more disciplined from top to bottom. We’ll have more stuff on Wim Hof’s work soon, as I just finished Scott Carney’s book What Doesn’t Kill Us: How Freezing Water, Extreme Altitude, and Environmental Conditioning Will Renew Our Lost Evolutionary Strength. And soon I hope to take on the 10-week course that Wim Hof presents at his website. You’d think that I’d have movement figured out at this point, right? I mean, with 57 posts over the past couple years on the subject of movement, it’s not a subject I shy away from. Well, yes, that’s partially true. I do read and write a lot on the subject of movement and try a lot of different stuff, but therein lies the problem: I try a lot of different stuff and don’t pick one system to work on. So this year, I’m going to be returning to the basics in a big way: back to MovNat. The goal is to work toward my certification in the discipline by mid-2019, and 2018 is going to be a big “prep” year for that as I also concentrate on the skills and ideology that served me so well back in 2013, during my best year in OCR. I’m going back to what worked best for me, and I’m going to be talking about it a lot. So that’s it. Short and sweet, but full of meaning for me and hopefully you as well. If anything here really resonates with you, I’d love to hear about it in the comments below.